It may be a little early to start thinking about holiday baking, but I can’t keep these cookies to myself any longer. If you ask me, these are exactly what ginger cookies should be like. Soft and chewy, and highly addictive. Made with protein-rich almond flour and blackstrap molasses, these cookies are surprisingly loaded with iron, calcium, copper, magnesium, and potassium. Naturally sweetened with pure maple syrup, they’re also egg-free and dairy-free! While I prefer my ginger cookies soft and chewy, if you’d like them more crispy, simply press them into flatter shapes before baking and increase the baking time. Combine all of the ingredients in a medium bowl, and mix until a thick batter is formed. Chill the batter for 30 minutes in the fridge, to make sure it’s nice and firm before scooping. Preheat the oven to 350F and drop the batter by rounded tablespoons onto a baking sheet lined with a Silpat, or parchment paper. Use a wet fork to flatten each dough mound, into your desired cookie thickness. If you’d like a sugar topping, try sprinkling a bit of low-glycemic coconut crystals over the tops before baking. Bake for 8-10 minutes, until firm around the edges, but still soft in the center. Allow to cool on the pan for 10 minutes before transferring to a wire rack to cool completely. 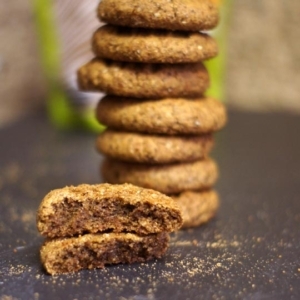 Made with protein-rich almond flour and blackstrap molasses, these cookies are surprisingly loaded with iron, calcium, copper, magnesium, and potassium. 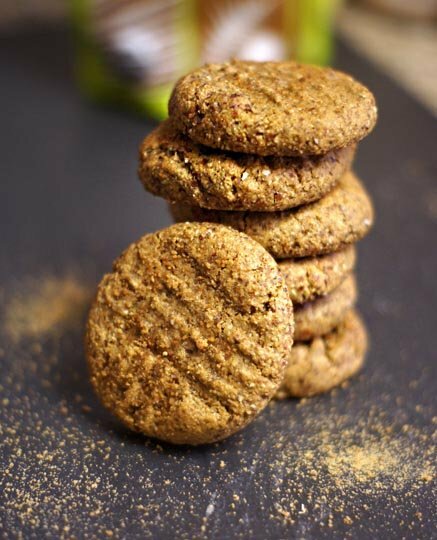 Naturally sweetened with pure maple syrup, they're also egg-free and dairy-free! While I prefer my ginger cookies soft and chewy, if you'd like them more crispy, simply increase the baking time and press them into flatter shapes before baking. Combine all of the ingredients in a medium bowl, and mix until a thick batter is formed. Chill the batter for 30 minutes in the fridge, to make sure it's nice and firm before scooping. Preheat the oven to 350F and drop the batter by rounded tablespoons onto a baking sheet lined with a Silpat, or parchment paper. Use a wet fork to flatten each dough mound, into your desired cookie thickness. Allow to cool on the pan for 10 minutes before transferring to a wire rack to cool completely before serving. Reader Feedback: What’s your favorite type of holiday cookie? Ginger cookies are definitely my #1, but peanut butter balls and frosted sugar cookies are not far behind! Last week I had a ginger cookie bake-off. I made these cookies, my old recipe with the white flour exchanged for healthier almond flour and a ginger cookie recipe made with coconut flour and tapioca starch. It was great fun testing the cookies. Megan’s recipe was the favorite, however, it was missing two thing in our opinion. My old recipe was a very close runner up because it contained freshly grated ginger and chopped crystalized ginger and if you like ginger flavor, it was pretty spectacular.. So today I modified this recipe adding 3/4 tsp freshly grated ginger and 1/4 cup finely chopped crystalized ginger. They are a winner now in our household. I do miss the chewiness of my old recipe as I used coconut sugar but I know I won’t get that same chewiness with maple syrup. However, I think that for a healthy ginger cookie, Megan’s recipe can’t be beat. Besides her recipe was the easiest to make with the least amount of dishes (YEAH) as I didn’t need to use an electric beater. These are absolutely amazing! I cannot eat coconut so substituted avocado oil. I’ll have to make a double batch next time, they’re going fast!! I don’t usually leave reviews, but I LOVE these cookies! 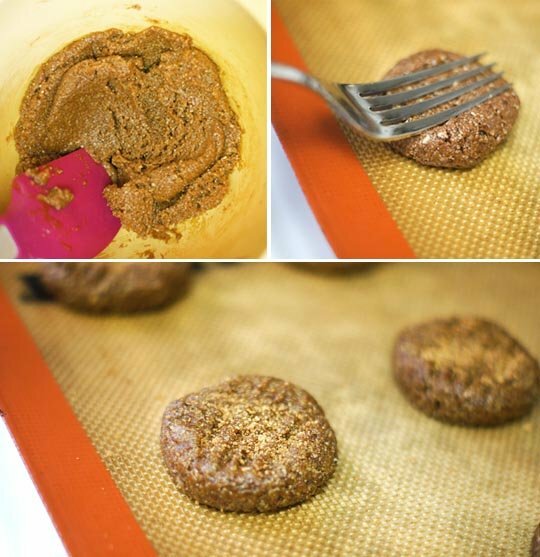 For the past year, this has been my quick go-to cookie recipe. I try to eat mostly gf and processed sugar free, and these are perfect! I just put my dough in the fridge and am so excited to try them. I have a house full of small children today, so am happy I can give them a healthy treat instead of a sugar filled one that would make them feel yucky. Thank you! Holy cow these are some really good cookies. Better than gluten! I made a few changes: I used goat butter instead of coconut oil, I added a teaspoon of cinnamon, I used normal molasses (just what I had) and mmm it was so good! I can’t wait to make these again!! So yummy and the texture is crispy on the outside and soft inside. Perfect!